Is this Rotoflex coupling bad? I'm still learning my car so I apologize for all the stupid questions. I noticed these microfractures in the rubber donut on one side (it looks like the other side was changed at some point while this one was not). If it requires replacement, I would go to a full CV joint conversion as sold by RDent. you'll get 100 different opinions on this. I'm sure the consensus will lean toward "better safe than sorry" and urge you to replace, but in reality, looks to me like plenty of life left. a lot depends upon your driving style. If you're competitive, it will strain those couplings to their max. If you're relaxed driving, then less so. Micro-fractures, as you describe, are the natural drying out of the rubber and to be expected since they are probably just on the surface. i'd be more concerned about deep fractures or separation, then you've got a ticking time bomb. There's a post elsewhere on the forum that shows an actual broken through donut that was in regular use and only just now replaced. since they are bolted in six places (3 on each direction), then the entire integrity of the donut is being used as a whole. All this to say, i'd continue driving and just check them regularly and monitor for further degradation. tedtaylor wrote: you'll get 100 different opinions on this. I'm sure the consensus will lean toward "better safe than sorry" and urge you to replace, but in reality, looks to me like plenty of life left. a lot depends upon your driving style. If you're competitive, it will strain those couplings to their max. If you're relaxed driving, then less so. I like this reply. Given the amount of money I'm about to put out on other repairs, I really would like to defer this item until the spring or summer! This car is not a competition machine; just a lazy weekend driver. I'm pretty easy on my cars' drivelines anyway. Given their ages, I see no reason to put undue stress on them by needlessly violent acceleration while tearing up back roads. gosh, we are neighbors! Have you joined PALS yet? I was just down across the river from you Saturday driving scenic South Jersey farmland and taking in all the foliage (which is now pretty much gone!) We should get together some time. Look me up (address on my website). I agree with Ted. If you're a considerate driver, like you say, you won't have trouble for a while. The danger comes when the rubber starts parting from the metal separators and there are no signs of that on your photo. tedtaylor wrote: gosh, we are neighbors! Have you joined PALS yet? I was just down across the river from you Saturday driving scenic South Jersey farmland and taking in all the foliage (which is now pretty much gone!) We should get together some time. Look me up (address on my website). Yes, I have! The car has been in a constant state of running but not quite legal since purchase, largely due to the birth of our first child, so I haven't managed to participate in any of the PALS events. I have come across your site before in my travels. I even sent the coupe you have up on CL to some friends! That's fine, you haven't even got the usual splits where the rubber is pulling away from the steel. Mine pretty much look like this all the time. The horror stories about them letting go seem to be a little over the top. Years ago I pulled one out in two pieces. It was still working but had started to make strange graunching noises which is why I investigated. Later cars had a safety pin in the centre of the diff yoke which was supposed to stop the driveshaft flailing around if the inboard rotoflex let go. The fact that the famously parsimonious Mr Chapman included this addition makes me think that there is something to the horror stories. If my car didn't have the safety pin, and I had any questions about the state of the rotoflex couplings, I think I would move to CVs immediately. Even if everything seemed OK, I would have CV replacement on my long term shopping list. I really don't think there is much to recommend rotoflex. Did the Elan ever suffer from a spate of rotoflex break up accidents? I wonder how much of a safety measure the pin actually is or whether it came about through some kind of Naderesque marketing led concern - a kind of 'weld 'em on and add it to the list of next year's safety upgrades' approach. Anyone got any experience of the safety pin restraining things (or not) when a rotoflex broke up? Does it actually work or does it just snap off or bend when the drive shaft starts to move around? It doesn't look that substantial. The pins do not do you much good - on my Plus 2 they sheared off when the donut failed. They are just to small a diameter to restrain the loads under a high torque failure situation i believe. Thanks for that Rohan. It looks like the pin may not be up to the job in its current form but I'd guess there's a limit to how much you could increase the diameter before it couldn't articulate with suspension movement given the space available. I suppose the consequences of a rotoflex breakup would be different each time and could vary from just losing drive to (with an inner coupling failure at speed) the drive shaft flailing around and destroying everything within reach - or is that worst case scenario unnecessarily melodramatic. Presumably a disc end rotoflex failure wouldn't be quite so life threatening. In my experience almost all rotoflex coupling failures occur at the inner coupling and occur to be noticed when at slow speed during acceleration which is the highest torque condition on the coupling. Probably 50% of the time the failure results in the shaft hitting the chassis just above it and damaging it.. Thank you all for your advice and experience. I'm going to keep an eye on it and reconsider the CV joints next fall. Interestingly, the prior owner of my car seemingly only replaced items as-needed but rarely in pairs. The other Rotoflex coupling and hardware is clearly and visibly newer than this one and in far better condition. I'm finding a lot of little Easter eggs on the car like this. I've 'halfway house' drive shafts of an outer CV and an inner donut. The donut is perfect after about twelve years of use. IMHO a contrubutory cause of donut failure is the donut being stretched unreasonably when the car is jacked up on the sill and the rear suspension is fully extended. I use a block underneath the rear 'wishbone' whenever I jack up the car to avoid this. The only time the suspension is allowed to fully droop is when I'm checking the inner donut for wear cracks and, so far, they are in excellent order. I like the effect of a donut softening the drive train and, although the S4 is driven 'spiritedly' on track and on continental rallys, I am careful to avoid harsh starts off the line, so no hill climbs or sprints for me. I also have a 'spare' pair of donuts (from Miles Wilkins) 'just in case'. 7skypilot wrote: I've 'halfway house' drive shafts of an outer CV and an inner donut. The donut is perfect after about twelve years of use. I know I'm complaining about a 51 year-old British sports car that was engineered by a small, focused team of engineers but I find the whole "keep the rear a-arms slightly elevated" thing to be maddening, especially if you work on the car with a lift. 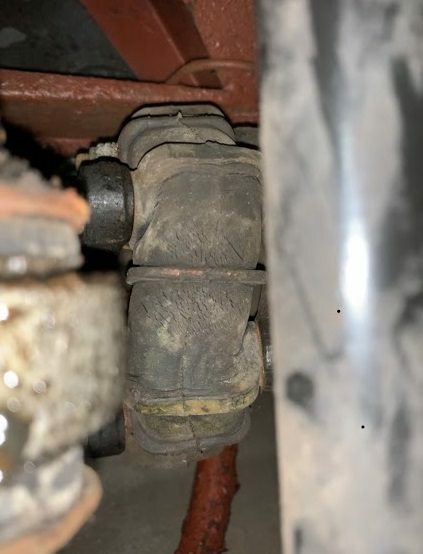 I use a QuickJack and do my best to remember to slip a jackstand under there but I do feel like this is one of my main reasons to go to CV joints.